ok I tried to be as objective as possible when taking the pics, though, even slight change of the angle produced quite different results rly. Scale of the image is whole another story. This is my before picture, 5 months or maybe bit longer old. Looks much much better, the hair is dry on that picture. Now the latest picture, the hair is slightly greasy / wet (I applied the progesterone. It may be contributing to at least my impression that the 3 weeks old picture looks a bit better. I think I have not lost any hair in the last 3 weeks, surely I cant pull any out so if its not falling out it should not look any worse. And because I think it does look a bit worse, I guess its the greasy look that made it look more thin and thus makes the temple to look bigger. Not sure of course. I may try taking more pics later with dry hair and will see. on the latest picture you can see an area of newly growing hair, in reality (if flash camera is not used) this looks much thicker, There are now I’d say 50 or so, terminal looking hair growign there. On the camera they do not show because they are sparse a lot and thus are unable to cast shadows, thats why on the flash camera it looks pretty much bald. All in all, if you compare the last two photographs, you should see that these hair are thickening there. I think that this area could completely fill in, in 6 months or so, but thats just my wish atm. I should have also said that I used to empty few dut capsules into the can of the natural progesterone cream. » of the natural progesterone cream. You dont use Dut anymore ? EDIT : I read your answer to rev. You dont need to answer me anymore debris on this. » » of the natural progesterone cream. » You dont use Dut anymore ? I don’t because I run out of it a month ago or so. its possible that the latest picture looks a bit worse because of that, though I’m not rly convinced, its a bit different angle, and the hair is greasy on the last picture and that surely makes it look a bit worse. Other thing is that on the last picture at the top part of the area, it looks to me that I’m having some thickening there. 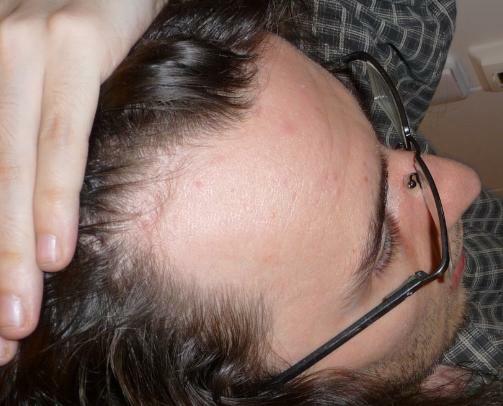 Also on the latest picture its visible that there is a lot more of hair growing underneath the hairline. 3 weeks ago I was not able to capture it on the camera at all almost. Now there you can see a touch of shadows thats due to the new hair. BTW anyone can recommend a good and reliable source of dut? » BTW anyone can recommend a good and reliable source of dut? Are you considering Oral Dut intake Debris? » » BTW anyone can recommend a good and reliable source of dut? » Are you considering Oral Dut intake Debris? I have already been on oral dut. no sides so yes I want to get back to it. » » » BTW anyone can recommend a good and reliable source of dut? » » Are you considering Oral Dut intake Debris? » I have already been on oral dut. no sides so yes I want to get back to it. How often did you use this progesterone cream? do you recommend it better than minox (if you’ve used minox before)…when you put dut in the cream, how long did you leave it on your hair for? Hi, I have to say Im impressed with the pics, there is definite improvement there. What is your routine, do you use minox as well? Any sides from the progesterone cream? And where did you get it, or did you make it yourself? Where are the studies that say progesterone can reverse hair loss? can someone post here? » » » » BTW anyone can recommend a good and reliable source of dut? » » » Are you considering Oral Dut intake Debris? » how long did you leave it on your hair for? I had used minox before in temples and on the whole scalp, and it did not grow much hair in temples for me. 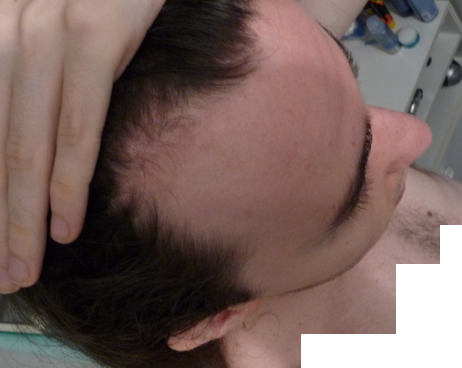 I gradually given up on minox ages ago when I decided that I’d rather see the bald truth then to be affraid to stop minox later on (its just my personal choice, I don’t like minox because from the graphs it looks that minox only gives you lets say 100 new hair per inch, but does not stop balding, so you are balding but have 100 extra hair per inch squared, and when you stop you lose the 100 extra hair in few months and will end up the same as your twin who did nothing all the time). 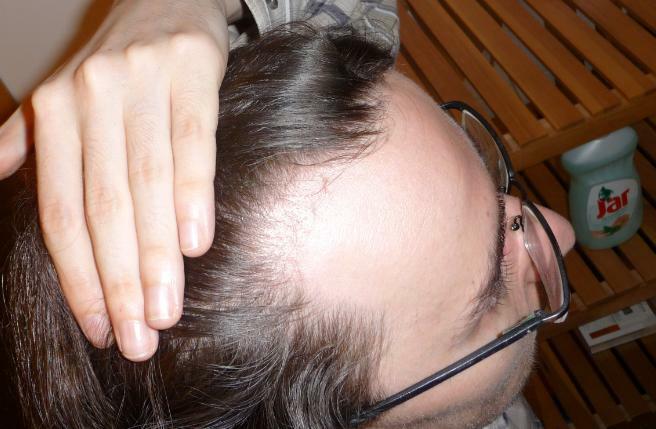 Anyway so short answer is - minox was growing vellus hair in my temples but not much terminal hair. Definately nothing even remotely close to this progesterone regrowth. and loads of other things I tried before. I do not use minox at all. See my previous answer above this post. there is a study that shows that progesterone was similarly potent in inhibiting DHT as finasteride. There are also studies that show that if dose is high enough, progesterone binds to the androgen receptors as well. My full routine is this: progesterone cream to temples few times a day (1-4, I sometimes apply it, it dries out, and 15 minutes later I put some more there), I used to empty some dut capsules into the progesterone cream, but run out of dut so I dont use it anymore. Ketoconazole shampoo (Revita) daily, sometimes I add PTO shampoo to it and use both mixed, I leave the shampoo 15 minutes on my scalp each day at least (I work at home so I can do it without problems :)). I DO NOT use minox, nor any other topicals. Now the pills: was on fin most of this year and several years before, on dut for few months this year, fin again now because I run out of dut. When taking fin I take 1.25mg / day. When on dut I used to take 0.5mg caps a day. I take maca root (1-4 what looks to me like 500mg capsule a day) (that gave me teenage hair density all over, but the temples), centrum multivitamins, colostrum (good to get rid of your scalp itch, and allergies), vitamin B complex, sometimes coenzyme Q10, when I was taking DUT, I was also taking ZMA at night together with the dut. ZMA increases T and possibly can damage your hair, so investigate it first, please. Recently I added kudzu root (just an experiment rly). Most of my succes is due to copying a regimen of a guy who calls himself “Prague”. A year ago or so he claimed to go from thin nw3 to nw1. His regimen was loads of naturals, progesterone, and warrior diet. He swears by Maca root, progesterone to temples, kudzu, and the warrior diet. Use google to find more about that guy. The only flaw in his claims always was his “no pictures” policy. All in all, if you want my opinion, the big 3 could be improved to big five just by adding progesterone and maca. Before I started maca I had been on fin for already several years, My hair was holding ok, but it was not the hair I used to have as a teenager. Now I have a rock star hairdo. Just month on maca, and I could see tiny little hair growing all around everywhere on my scalp. If progesterone is good for temples, then Maca is at least the same good for overall density. PLEASE post your exact regimen, including all supplements (by name of manufacturer) and the amounts you take daily. After reading about Prague, I am extremely interested in yours and his regimens. I know that you use Dut already, so I am not interested in that. » you use Dut already, so I am not interested in that. My full routine is this: progesterone cream to temples few times a day (1-4, I sometimes apply it, it dries out, and 15 minutes later I put some more there, I use swansons brand), I used to empty some dut capsules (Dr reddy’s dutas) into the progesterone cream, but run out of dut so I dont use it anymore. Ketoconazole shampoo (Revita) daily, sometimes I add PTO shampoo (neutrogena t-gel european version for greasy hair, contains Pyroctone olamine) to it and use both mixed, I leave the shampoo 15 minutes on my scalp each day (I work at home so I can do it without problems ). I DO NOT use minox, nor any other topicals. Now the pills: was on fin most of this year and several years before, on dut for few months this year, fin again now because I run out of dut. When taking fin I take 1.25mg / day (quarter of the fincar made by cipla). When on dut I used to take 0.5mg caps a day (Dr reddy’s dutas). I take maca root (1-4 what looks to me like 500mg capsule a day, I buy it at random places, but the ones they sell on swansons are fine as well) (that gave me teenage hair density all over, but the temples), multivitamins (centrum brand), colostrum (good to get rid of your scalp itch, and allergies. I use Barny’s Colostrum brand, 1 or 2 caps, every other day or so, on empty stomach, with loads of water (it needs to go through your stomach), then I eat on it), vitamin B complex (local generic brand rly), sometimes coenzyme Q10 (bought on swansons), when I was taking DUT, I was also taking ZMA (3x 500mg caps before the bed)(bought at a local gym) at night together with the dut. ZMA increases T and possibly can damage your hair, so investigate it first, please. Recently I added kudzu root (just an experiment rly, brand is Pharma active, I pop one capsule sometimes 2 a day). I am going to evaluate L-Taurine supplementation next. If not stated otherwise, take the supplements together with your food. I’m not too obsessed with dosages rly, I often skip doses, sometimes take less, on other days take more. The key stuff is oral finasteride which I have been on for years already and rarely skip a dose, the revita+pto shampoo 15 minutes a day, again sometimes I’m in hurry, but most of the days its 15 mins rly), Maca root (I recommend 2 or more 500mg caps a day), and progesterone cream applied to temples several times a day (mornings gently so it does not mess up your hair, evenings, use a bit more, let it soak in, and then add some). If you are already using minox, stick with it. If you are not, then my decision would be to stay away from it, but its your choice rly. Thank you, debris! I know that some of the information was posted in your journal, but wanted to see the nuts and bolts. That sounds like a very good regimen that is also not so complicated. Thanks, again.